The Israeli military’s 22-day attack on Gaza in the winter of 2008-9 provoked international condemnation to a degree that the region’s daily deprivation since 2007 under Israeli and Egyptian blockade had not. After the assault, images of the ruins of Gaza – its collapsed buildings, its disabled and impoverished residents – circulated widely. 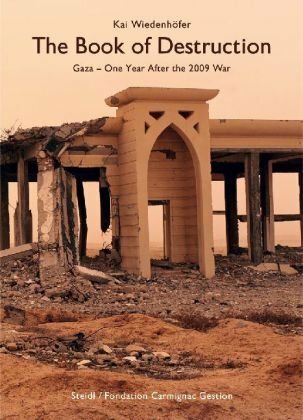 Beyond recording the immediate destruction caused by the attacks, however, these representations also sought to convey a different kind of ruin: the ‘slow violence’ (Nixon 2011) of Gaza’s humanitarian crisis. Anna Bernard will explore some of the visual and narrative attempts since 2009 to draw attention to the full scale of Gaza’s devastation, including photography by Kai Wiedenhöfer and poetry by Suheir Hammad. [The title is taken from Suheir Hammad’s poem GAZA, and the video shows Wiedenhöfer’s exhibition at the Musée d’Art Moderne in Paris in 2010]. Anna Bernard works on literary and cultural representations of Israel/Palestine in international contexts. She is the author of Rhetorics of Belonging: Nation, Narration and Israel/Palestine, forthcoming from Liverpool University Press. While the Gaza Strip is often associated with images of ruins and destruction as a result of the continuous Israeli bombardment, the rubble of destroyed buildings has also become closely associated with the national cause. In 2009, a young artist living in Jabalia Camp turned her bombed house into an installation of a tank. Her message was that holding on to living spaces was as powerful as any military machinery. 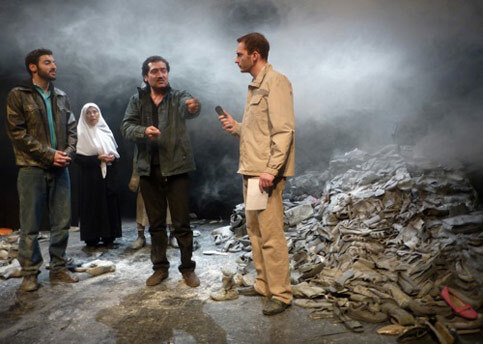 Ahmed Masoud will discuss the representation of ruins in his plays Go to Gaza, Drink the Sea (2009) and Unto the Breach (2012). Working with various set designers, Ahmed chose to represent rubble using different materials. In Go to Gaza, Drink the Sea (left) destruction was represented through a mountain constructed out of thousands of old shoes, while the set of Unto the Breach compiled a collage of ripped clothes, palates, paint pails and other broken and recyclable materials. Both sets represent the hardships, but also the resourcefulness, of ordinary people living under siege. 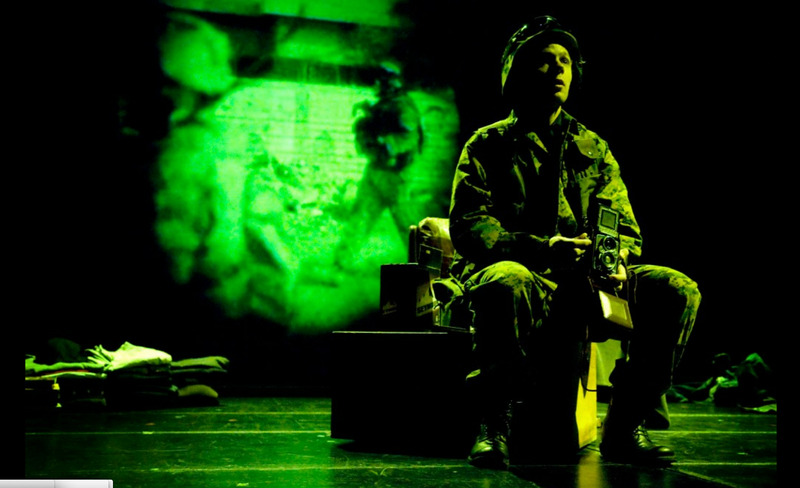 They also reflect the process of making the set and shows with a very limited budget. Ahmed Masoud is a Palestinian academic, writer and director. In 2005, he founded the Al Zaytouna Dance and Theatre Company. With Justin Butcher he co-wrote and directed the successful play Go to Gaza, Drink the Sea (2009), staged in London and at the Edinburgh Fringe Festival, and the BBC Radio 4 Play Escape from Gaza (January 2011). Ahmed also won the Muslim Writers Awards (sponsored by Penguin Books) in the unpublished novel category for his book Gaza Days. 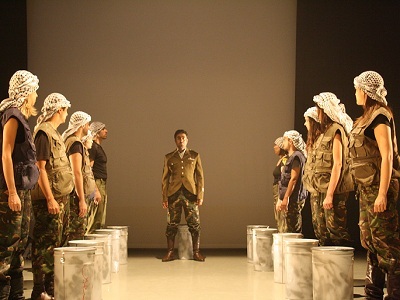 His latest show Unto the Breach (right) [a dance adaptation of Shakespeare’s Henry V] was performed at the Artsdepot Theatre in November 2012 and received critical acclaim. 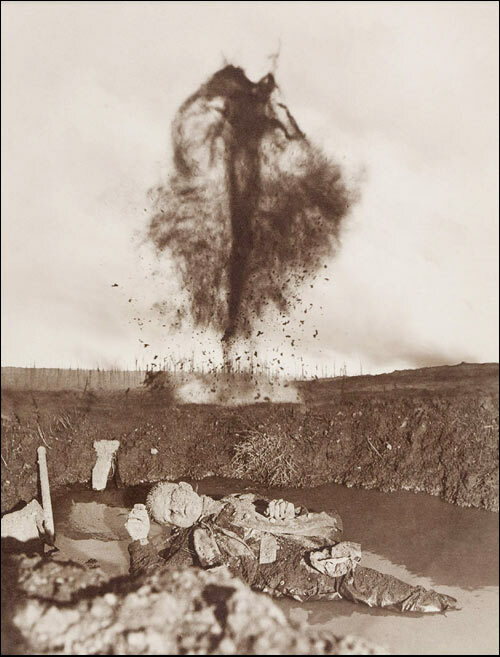 The exhibition takes a critical look at the relationship between war and photography, exploring what types of photographs are, and are not, made, and by whom and for whom. 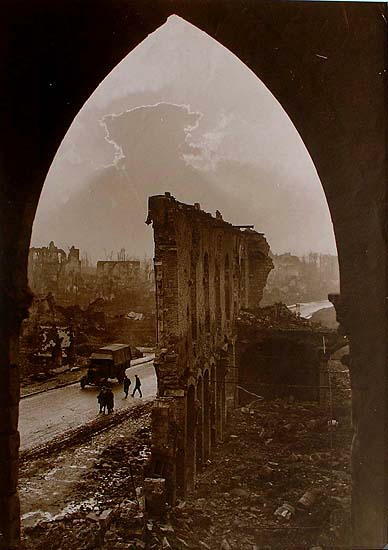 Rather than a chronological survey of wartime photographs or a survey of “greatest hits,” the exhibition presents types of photographs repeatedly made during the many phases of war—regardless of the size or cause of the conflict, the photographers’ or subjects’ culture or the era in which the pictures were recorded. 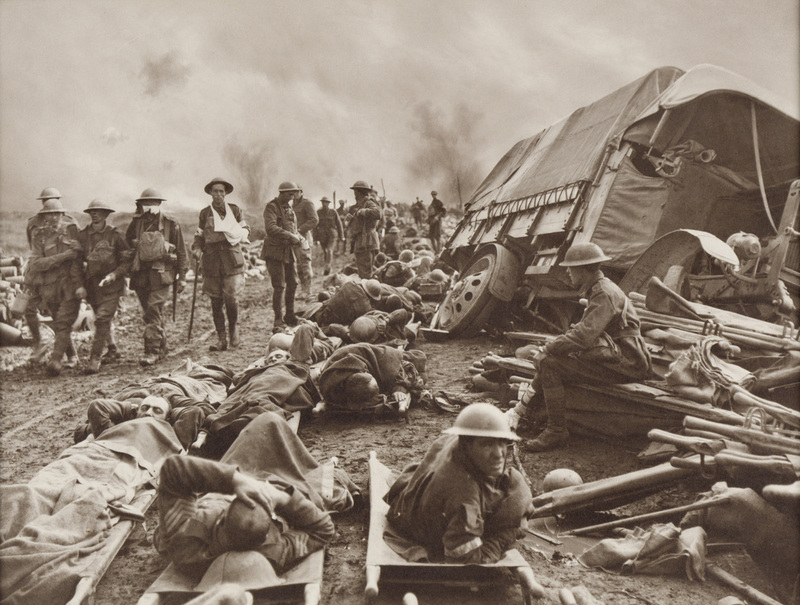 The images in the exhibition are organized according to the progression of war: from the acts that instigate armed conflict, to “the fight,” to victory and defeat, and images that memorialize a war, its combatants and its victims. 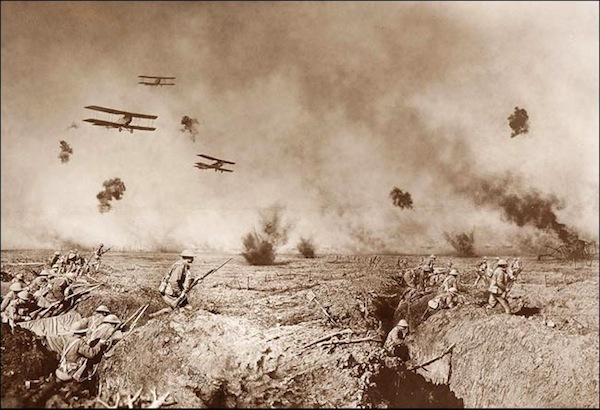 Both iconic images and previously unknown images are on view, taken by military photographers, commercial photographers (portrait and photojournalist), amateurs and artists. Elissa Curtis previewed the exhibition in the New Yorker last year, and included a mesmerising gallery of 28 images from the collection (whose coverage starts in 1846 with the Mexican-American war); there’s also a longer discussion (and a smaller gallery) in Carol Kino‘s New York Times review. 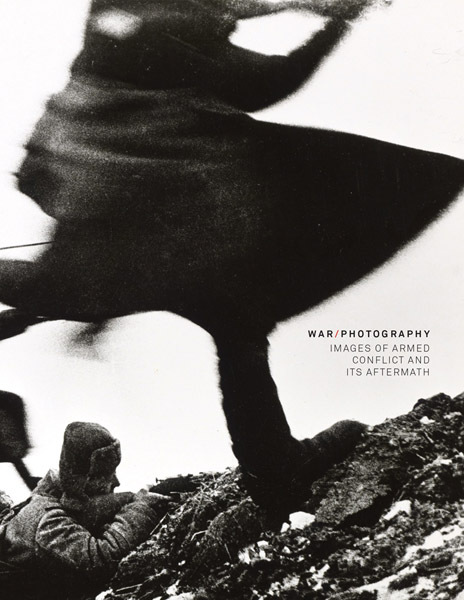 The accompanying book (right) War/Photography by Anne Wilkes Tucker and Will Michels with Natalie Zelt, is available from Yale University Press. Drawn from the real life accounts of top conflict photographers, Boca del Lupo examines the juxtapositions and internal struggles that many photogs experience between foreign soil and home turf; between privilege and suffering; between disconnect and belonging; between war and peace.With verbatim text from interviews with award-winning war photographers and international journalists, dazzling physicality, computer animation, video, and physical theatre, the end result is a deeper connection between our own lives and the lives of those we see in the news every day. 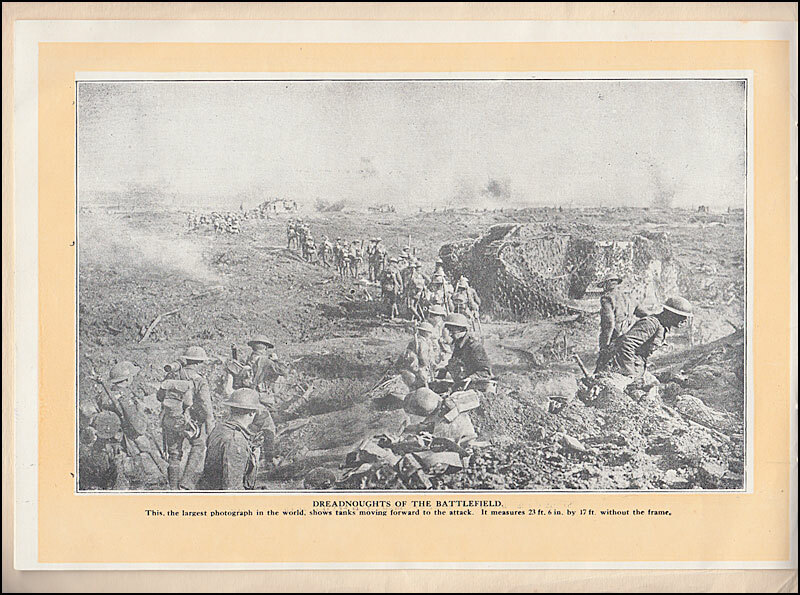 Click on the image shown here for a gallery. Some background to the one-man show here and here. Thanks to Jorge Amigo for the info – we’re off to see this tomorrow night. When Stanley Kubrick had Major Kong (Slim Pickens) straddle a nuclear bomb in Dr Strangelove (1964) and ride it exuberantly all the way down to its target – surely the most iconic image from the film – he was making an obvious visual point about masculinism, sexuality and military violence that, as the clean-limbed image above shows, takes many other, non-nuclear forms. 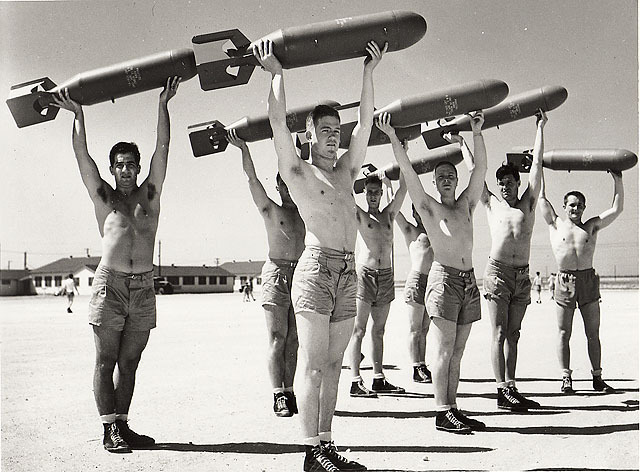 Here a group of US Army Air Force bombardiers in the Second World War practices calisthenics with 100 lb bombs. A different sort of ‘love-charm of bombs‘, you might think. 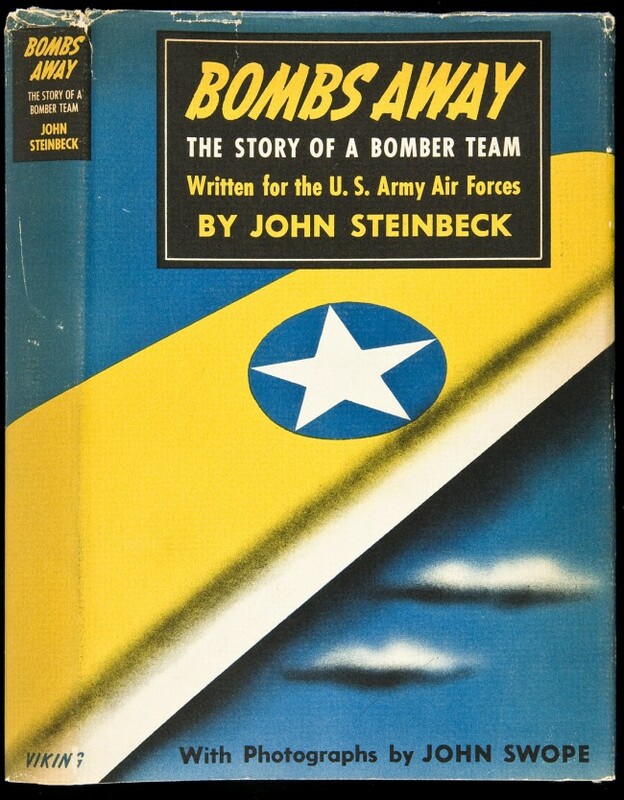 The author of all this was, astonishingly, John Steinbeck, and the book Bombs Away: the story of a bomber team, published in 1942. In May 1942 Steinbeck had been summoned to Washington by General Henry A. 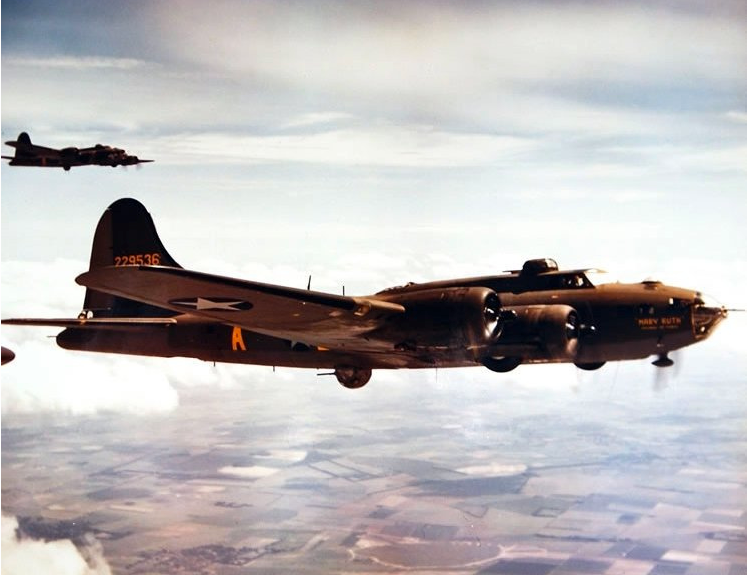 “Hap” Arnold who explained what he had in mind – an account of the training of a bomber crew that would serve as a recruiting platform – and although Steinbeck was at first reluctant a meeting with President Roosevelt convinced him to accept the assignment. 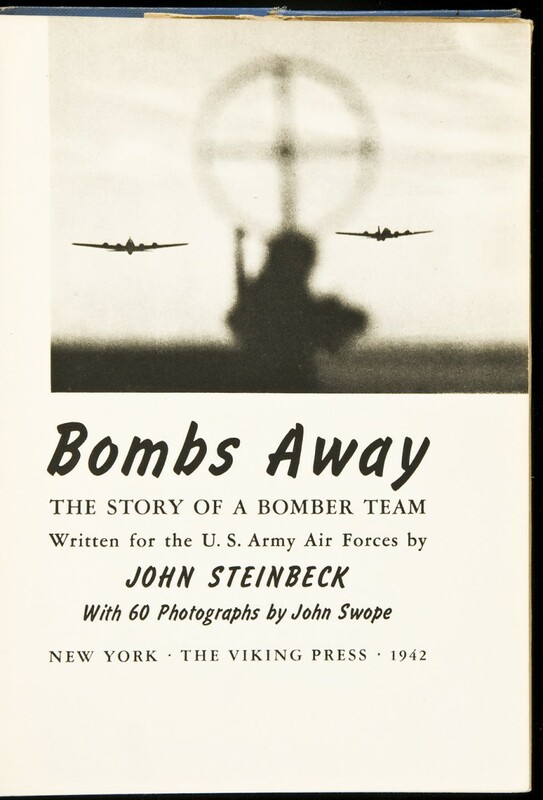 He spent the summer on the road (in fact, much of the time in the air), travelling from airbase to airbase in the United States with Hollywood photographer John Swope, who provided 60 illustrations for Bombs Away. Swope would later be tapped by First World War veteran Edward Steichen for his US Navy photographic unit covering the war in the Pacific, where he produced a remarkable photographic portfolio and the accompanying Letter from Japan in 1945. 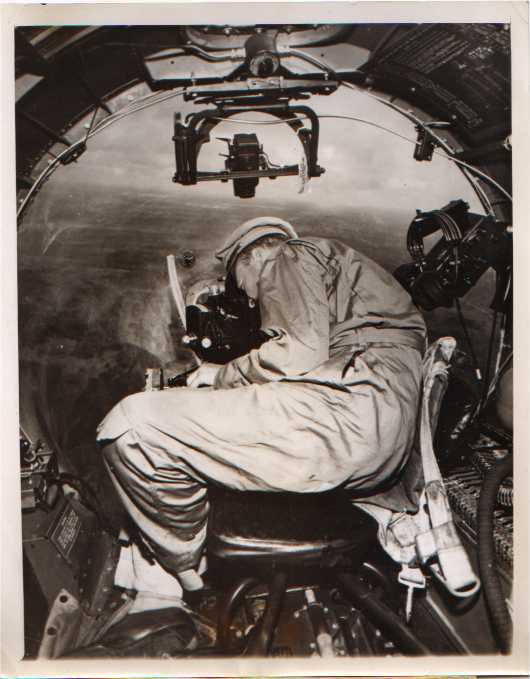 Bristol was also later recruited by Steichen, and some of his war photographs would not been out of place in Bombs Away: the image on the right, ‘RESCUE: PBY Blister Gunner’, was shot in a Catalina Flying Boat at Rabaul, Papua New Guinea, in 1944, which presumably explains the flying kit. He wasn’t alone. A review in the New Republic declared that Bombs Away bore ‘about the same relationship to literature that a recruiting poster does to art.’ But of course it was supposed to be a recruiting poster, and it had to be written in double-quick time. Steinbeck knows, of course, that this is a deadly serious ‘game’: and one that, as he also labours to explain, is objective, scientific: ‘They knew the mathematics of destruction.’ Within this embodied, techno-cultural constellation the Norden bombsight (left) occupied a central place. I’ve noted before how often bombing depends on abstraction: on a technical division of labour within the kill-chain, on a rhetoric of scientificity (and, by extension, precision), and on a calculus that transforms places and people into the co-ordinates of a target. Bombs Away shows this to perfection, but it shows something else even more clearly. For the ability to carry out these deadly missions also depends on an instilled and instinctive sociality (here, naturally, a homosociality) that is far from abstract. But this paper knowledge turned out to be less than satisfactory. Less than a year later, in June 1943, his request to become an air force intelligence officer refused by the draft board – a US Army intelligence report, mindful of the sympathies of Steinbeck’s pre-war novels, had concluded that there was ‘substantial doubt’ about his ‘loyalty and discretion’ and recommended that he not be offered a commission – Steinbeck was at RAF Bassingbourn (USAAF Station 121) in Cambridgeshire as a war correspondent for the New York Herald Tribune. This is a far cry from the brimming, boastful confidence of Bombs Away, and Steinbeck is clearly concerned not only to change the tone but also to surmount the limitations of his new, temporary profession (some of his despatches were republished in 1958 in Once there was a war). He does so by invoking the the technical, instrumental armature of the mission: the precision of the briefing (‘The incredible job of getting so many ships to a given point at a given time means almost split-second timing’), the complicated process of kitting up (‘During the process the men have got bigger and bigger as layer on layer of equipment is put on; they walk stiffly, like artificial men’), and the meticulous work of the ground crews who ‘scurry about like rabbits’ as they prepare the aircraft and load the bombs. But here too it is above all the sociality, the camaraderie that drives and dominates the narrative. And it’s the end of this that brings Steinbeck’s reports to an abrupt end. 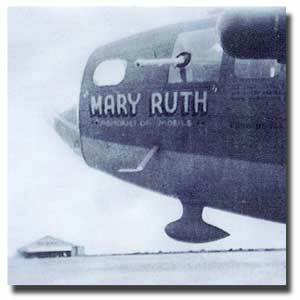 He had had in mind a series of 25 articles, but this was cut short when the ‘Mary Ruth’ (shown above) failed to return from a bombing raid on the Ruhr. But this was not the end of Steinbeck’s interest in (and enthusiasm for) the US military in general and bombing in particular. He was a vocal supporter of the Vietnam War, and in fact visited the South in December 1966-January 1967. In private he wrote that ‘I wish the bombing weren’t necessary, but I suspect our people on the ground know more about that than I do’ , and he refused all requests to sign petitions against President Johnson’s Rolling Thunder campaign. [For more on Steinbeck’s involvement in the two wars, see Thomas Barden, ‘John Steinbeck and the Vietnam War’, Steinbeck Review 5 (1) (2008) 11-24]. Note: Most of the crew of the ‘Mary Ruth’ survived (including Crain) and were taken prisoner of war. The most detailed account describes the ‘Mary Ruth’ being shot down by a fighter aircraft on 22 June 1943; Steinbeck’s reports for the New York Herald Tribune begin to appear on 26 June. The discrepancy is presumably explained by a combination of the time taken for his despatches to cross the Atlantic and wartime censorship. 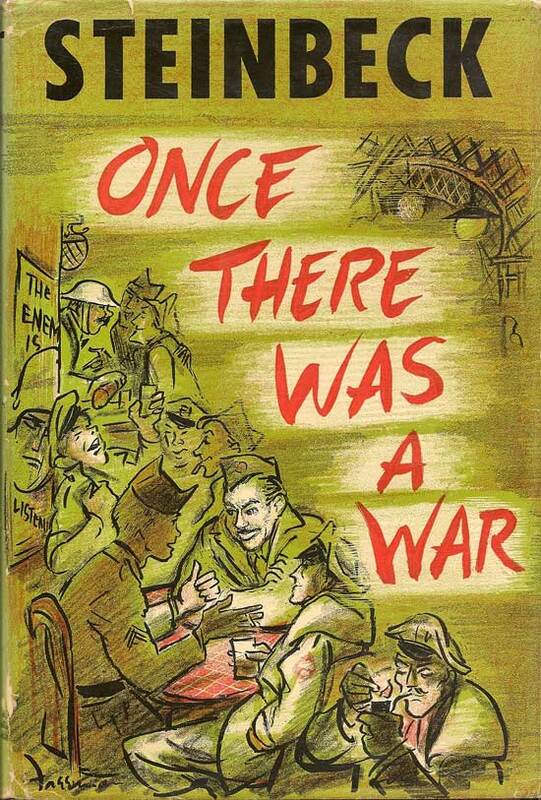 Both Bombs Away and Once there was a war are still available as Penguin editions, the latter with an enthusiastic foreword by Mark Bowden. The accompanying – monumental (512 pp) – book (under the same title) will be published by Nation Books in April. 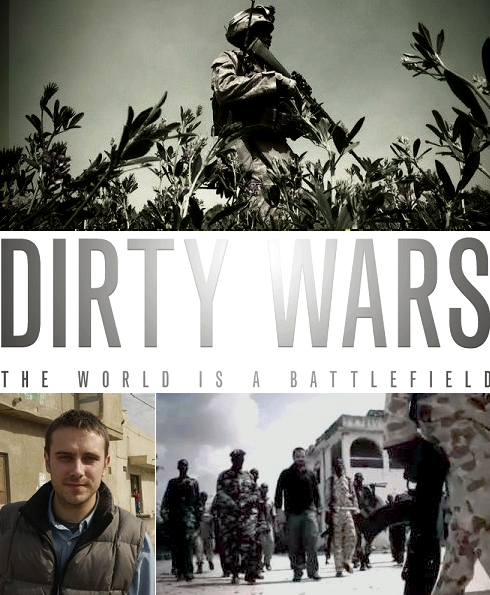 Filed from the frontlines of the war on terror, documentarian Richard Rowley’s astonishingly hard-hitting “Dirty Wars” renders the investigative work of journalist Jeremy Scahill in the form of a ’70s-style conspiracy thriller. A reporter for the Nation, Scahill follows a blood-strewn trail from a remote corner of Afghanistan, where covert night raids have claimed the lives of innocents, to the Joint Special Operations Command (JSOC), a shadowy outfit empowered by the current White House to assassinate those on an ever-expanding “kill list,” including at least one American. This jaw-dropping, persuasively researched pic has the power to pry open government lockboxes. Doggedly questioning the logic and morality of waging a war with no accountability and no end in sight, Rowley and Scahill are shrewd enough to recognize that one of the strongest weapons in their own arsenal is entertainment. 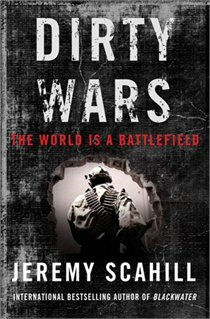 This isn’t to say that “Dirty Wars” is fun by any stretch, but that it takes pains to make the political personal, forging the viewer’s identification with Scahill by making persistent use of his voiceover narration and keeping him oncamera throughout. Scahill is no Redford or Hoffman, but one follows his train of thought and ultimately fears for his safety. I was in Lexington Thursday-Saturday to give the first of this year’s Committee on Social Theory lectures at the University of Kentucky. The theme this year is “Mapping“, and this was the first outing for “Gabriel’s Map: cartography and corpography in modern war”. The video will be posted online in a week or so, and there will also be an online interview with the journal disClosure, which is moving to a digital platform. I was last in Kentucky soon after I moved to UBC, so some time around 1989/90, to give one of the first of these lectures, and this occasion was as enjoyable as the first: many thanks to Jeremy Crampton and his wonderful colleagues and graduate students for such warm hospitality on such a chilly week! That said, being invited to talk about “Mapping” by Jeremy is like being invited to talk about Marxism by David Harvey, so I was relieved everything went so well; I learned much from the questions, comments and conversations, so no doubt the second outing will see a different presentation. Then, somewhere down the line, I’ll translate it into written form. One of the most enjoyable parts of preparing a presentation, for me anyway, is the image research and design, which invariably takes me to sites and sources I’d never otherwise find. And because it can take an age to find the right image, it slows down the process and gives me time to think more carefully (and I hope creatively) about the argument I’m developing. 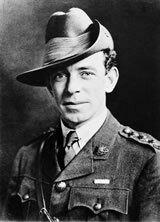 This was no exception: again and again, as I raided image banks on the First World War, I encountered the work of Australian photographer and film-maker Frank Hurley (1885-1962). 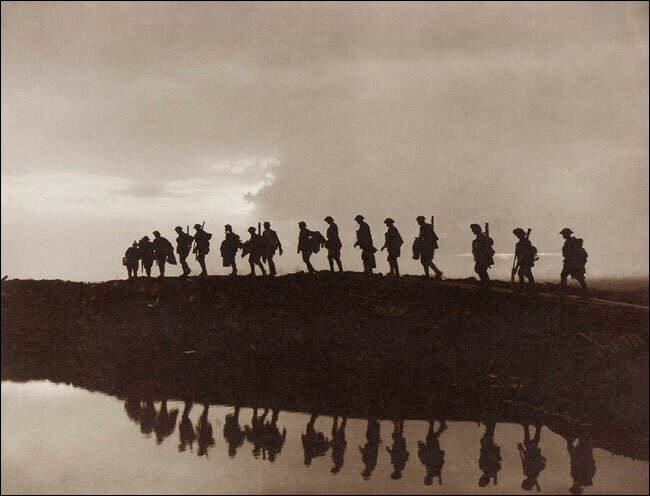 In fact, it’s one of his photographs that I cut for the banner of this blog (‘Moving Forward/Supporting troops of the 1st Australian Division walking on a duckboard track near Hooge, in the Ypres Sector’). 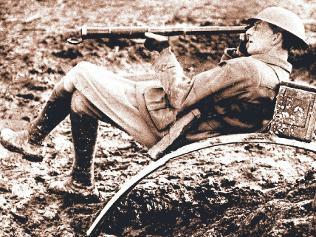 According to Robert Dixon’s engaging essay ‘Travelling Mass-Media Circus: Frank Hurley and Colonial Modernity’, Hurley had Canada in his sights because the Canadian War Records Office had staged a highly successful photographic exhibition at the Grafton Galleries in London the previous December, which had included vast enlargements using multiple negatives; the follow-up exhibition in July had as its centrepiece what was advertised as ‘the largest photograph in the world’, ‘Dreadnoughts of the Battlefield’, which occupied an entire wall of the gallery. Within days a compromise of sorts had been reached: Hurley was allowed to make six ‘combination enlargements’ for his public exhibition, provided they were clearly labelled as composites, and he withdrew his resignation. (For more on the spat between Hurley and Bean, and the vexed political-epistemological issues at stake, see here). You can see an animation of the composition process here and a video here, and although Hurley claims this as a ‘realistic’ photo-work, the process of composition is, again, an artfully studied one that was plainly intended to produce a particular aesthetic – and cinematic – effect. Even more than this, though, Hurley was – as Julian Thomas makes very clear here, a show man: Robert Dixon argues that by the 1920s ‘Hurley had become not only the ring-master but also the main attraction in his own travelling, international, multi- and mass-media circus.’ (Given how much I enjoy devising my own presentations, perhaps that’s also why I find the man so interesting….). And ‘The Raid’, sometimes also called ‘Over the top’ (shown leaning against a wall in London, left) was his bid to produce ‘the largest picture in the world’ (a quest which shows no sign of coming to an end). 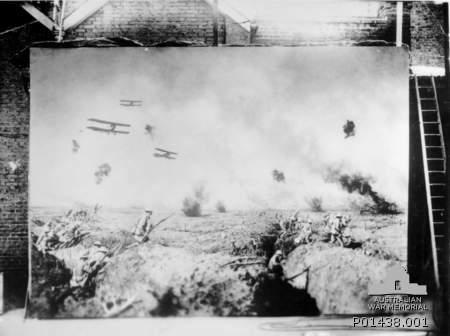 You can find online galleries of Hurley’s photographs from the First World War here. I used several of them in my presentation at Lexington, and so this excursion into Hurley’s war work is not a side-track: I also used passages from several novels (clearly noted as such), partly to trouble the simple distinctions between ‘fiction’ and ‘non-fiction’ and to draw attention to the constructedness of our histories, but partly too because there are some truths (sic) that can be conveyed most effectively through the imaginative resources of the novel. In the case of Tom McCarthy’s luminous novel C, which I’ve invoked before, there are complex relationships between the documentary record and the fictional narrative: C is clearly a work of prodigious imagination, but just as clearly saturated in archival research. 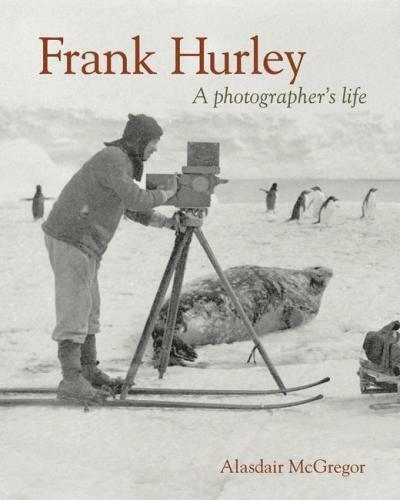 I’m left wondering what a latter-day Hurley would have made of it – and whether photographs are still subject to more stringent protocols than texts as a result of a presumptive indexicality. What now counts as ‘fakery’ once Bean’s ‘sacred records’ have become secularised? 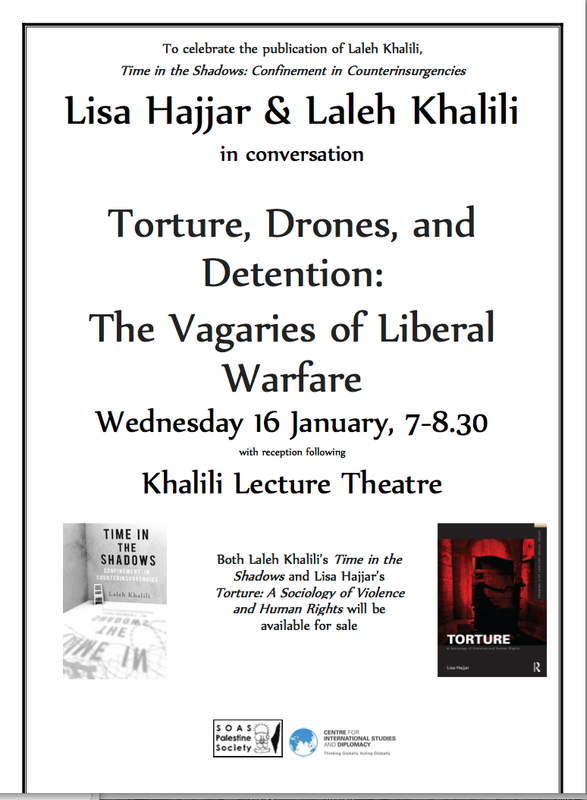 Lisa Bhungalia writes with the welcome news that Jadaliyya has audio of a conversation between Laleh Khalili and Lisa Hajjar on ‘Torture, drones and detention’ at SOAS earlier this month. The publication of Laleh’s Time in the shadows: confinement in counterinsurgencies (Stanford, 2012) and Lisa’s Torture: a sociology of human rights and violence (Routledge, 2012) is the occasion for a wide-ranging discussion of ‘the vagaries of liberal warfare’, including the intimacies between humanitarianism (indeed, the very idea of the human) and war. That said, some Israelis seem to have an astonishingly obdurate view of the power of social media – Rebecca quotes one member of Likud claiming that “Facebook pages … have as much impact as a tank – and sometimes even more” – and, as she notes, remarkably little sense of the countervailing possibilities. 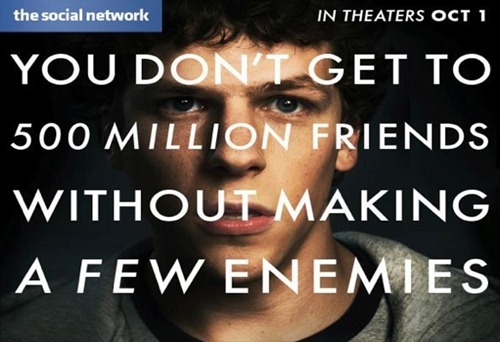 All of which makes me wonder about a sequel to David Fincher‘s film about Facebook founder Mark Zuckerberg, The social network (2010): in the light of Rebecca’s ethnographic work, the original poster (reproduced above) suggests an altogether different scenario….